The due date for payment in case of TDS on sale of immovable property under section 194IA and TDS from rent by Individual or HUF under section 194IB is 30 days from the end of the month. For eg – TDS deducted on 15th June 2016 is required to paid on or before 30th July 2016. A common question asked is what is the last date of payment when above mentioned due date falls on a Sunday or public holiday. In this case, the next working day can be considered as the last day of payment of Tax Deducted at Source. When you are making an electronic payment, keep in mind that payment made after 8 PM is processed on the next working day. And if this happens you can’t argue that I had made payment but bank processed it next day so payment is considered to be made the next day and you have to pay interest. Interest at the rate of 1% per month or part thereof, for the period from the date on which TDS is deductible to the date on which TDS is actually deducted. Interest at the rate of 1.5% per month or part thereof, for the period from the date on which TDS is actually deducted to the date on which such TDS is actually paid. Calendar month is considered in calculating interest therefore if you delay payment by one day, you have to pay interest for two months. For example, if TDS is deducted in the month of July and deposited on the 8th of August then you have to pay interest for 2 months i.e. July and August. Total interest payable shall be 3%. FAQ – I made payment to a contractor of Rs. 25,000 in May and didn’t deduct TDS as it is less than the threshold limit. In December same year, I paid Rs. 1,00,000 to the same contractor. Now I deduct TDS as per Section 194C on Rs. 1.25 lakh as it exceeded threshold limit of Rs. 1 lakh per year. Is interest payable for Rs. 25,000 from May to December. Answer – Even if the threshold limit of Rs. 1 lakh exceeded in December, you are required to pay interest on Rs. 25,000 from May to December at a rate of 1% per month. Interest paid on delay in deposit of TDS is not allowed as an expenditure under the Income Tax Act. 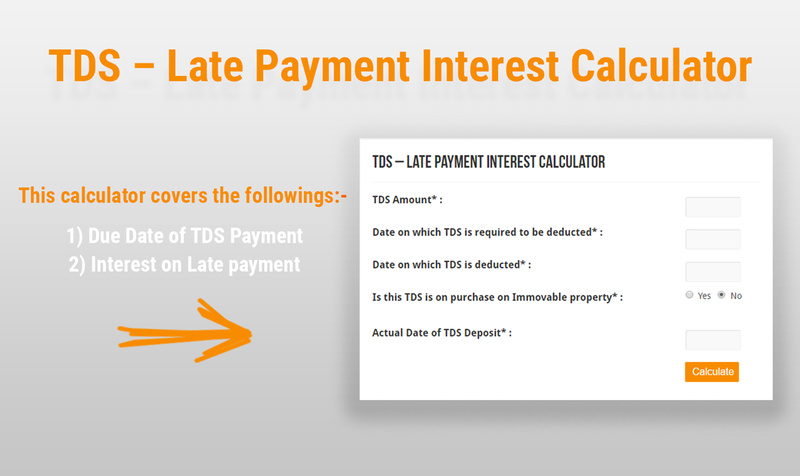 Notes – Interest on late payment of TDS can be paid before furnishing TDS return or after demand raised by Traces. Such interest can be adjusted from the amount remaining in any TDS Challan (under any section). The resident recipient has furnished his return of income under section 139. The resident recipient has taken into account the above income in its return of income. The resident recipient has paid the taxes due on the income declared in such return of income. The resident payee furnishes a certificate to this effect from an accountant in Form No. 26A. However, such person is also required to pay interest @ 1% from the day on which TDS is deductible to the date of furnishing of return of income by such resident payee. On the same day on which tax is deducted. On or before 7 days from the end of the month in which tax is deducted. When TDS is deducted by a person (other than an office of the Government) and Assessing Officer has permitted quarterly deposit of tax deducted under section 192, 194A, 194D and 194H. Assessing officer with prior approval from the joint commissioner may allow the quarterly payment of tds. In that case, the last date of payment is 7th of the next month after each quarter and 30th April for the last quarter.